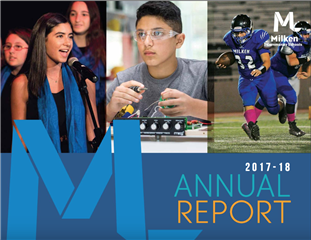 There are many ways you can contribute to Milken Community Schools. Every gift to our school, regardless of its size, sends a strong message that we are committed to our students, their education, and the future of the school. All gifts are tax-deductible. Contributions made by check, cash or credit card are tax-deductible in the year the donation is given. We accept Visa, Mastercard, and American Express. Please make checks payable to Milken Community Schools Annual Fund. You may achieve tax savings by making your gift via stocks or other capital assets. We recommend you consult your tax or financial advisor to explore the tax benefits specific to such a gift. Many employers sponsor matching gift programs and will match charitable contributions made by their employees. If you work for a company that matches gifts, you can double or even triple the value of your contribution. Contact your Human Resources Department for eligibility information and to obtain a matching gift form. We are pleased to receive gifts of goods or services that may provide a budgetary savings to the school or fulfill a particular departmental need. Per IRS guidelines, the school will provide a letter assigning a dollar value to an in-kind gift when substantiation of the value is provided by the donor. We recommend you consult your tax advisor to explore the tax benefits specific to such a gift.